This stunning space wallpaper shows the Whirlpool Galaxy, also known as M51 or NGC 5194, which is one of the most spectacular examples of a spiral galaxy. This stunning space wallpaper shows the Whirlpool Galaxy, also known as M51 or NGC 5194, which is one of the most spectacular examples of a spiral galaxy. 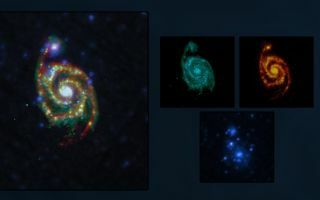 With two spiral arms curling into one another in a billowing swirl, this galaxy hosts over a hundred billion stars and is currently merging with its companion, the smaller galaxy NGC 5195.In this image, observations performed at three different wavelengths with ESA’s Herschel and XMM-Newton space telescopes are combined to reveal how three generations of stars coexist in the Whirlpool Galaxy.